April is just an amazing time of year for fishing, bass are starting to get active, the trout opener in the Eastern Sierra kicks off toward the end of the month and the ocean rockfish season opens. I’m really looking forward to rockfish season this year. Lingcod and their rockfish buddies have had four months to spawn, rest and have a few peaceful hook-free meals, but soon that’s going to change. My reels have new 60-pound braid, a spool of 40 pound Maxima monofilament is on standby for tying leaders and my kayak is itching to get salty! 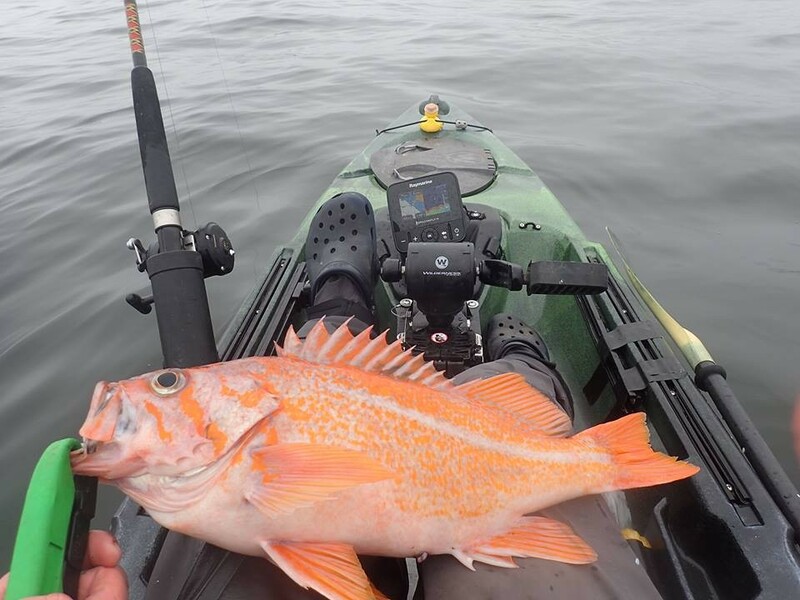 With the regulations changing this season to allow only one lingcod per angler, catching more rockfish will be vital to those of us out fishing for food. So, begins the focus of this article. 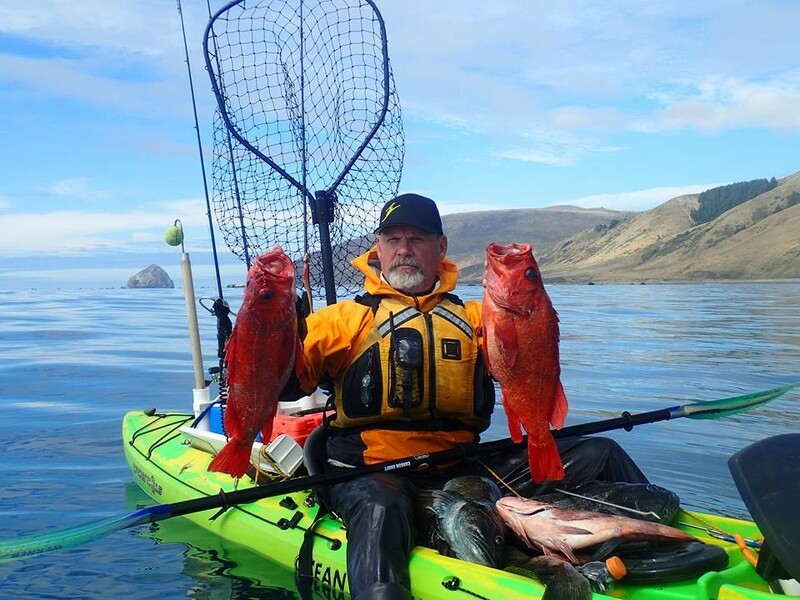 How can I catch more rockfish? Well let’s start at the bottom and work our way up. When I am specifically targeting rockfish, I put the swimbaits away and reach for one of two things, either a Branson Baits Mini Slug with a 3-4 oz. leadhead, or a 3-4 oz. P-Line Laser Minnow. Using a duo-lock snap I clip on the lure of choice to the bottom of my leader and then 15-20 inches above the lure I tie a dropper loop to attach a teaser. Warning the dropper loop weakens your leader and will be the weak point in your rig. Use a 3-way swivel and separate dropper leader if hunting big fish to eliminate some of that weakness. What teaser to choose? There are so many different options that I don’t have room to list them all, but will tell you about my favorites. I don’t really like dealing with bait, but squid or a small baitfish on the tip of any of the following will help increase catch rates. For a long time, I used the industry standard red and yellow shrimp fly, but I’ve been experimenting the last few years and have found some cool new tricks to put more fish in the kayak. Squirt a little squid Pro-Cure into the hollow body and they light the rockfish up! After the tubes, I tried all sorts of different things like Senkos, skirts from spinner-baits and just about anything else I had laying around. Surprisingly almost everything caught fish. The two things that surprised me the most and have become standards in my box are 3” smelt pattern Gulp Minnows, and a red hook with some holographic tape on the shank. The hook and holo tape was a real shocker! What the fish want can change on a day to day basis, so when I go out I like to bring a variety of different color Slugs and jigs as well as an assortment of different teasers. Unlike their sporadic feeding habits, the rockfish’s choice of shelter seems to be a bit more consistent. If you have a fish finder look for drop-offs and pinnacles, or better yet a big school of fish. Many of the species run in large schools. If you don’t have a fish finder start working the edges of the kelp, it grows on rocks. Often times one of my favorites, the Gopher Rockfish will be hiding deep in the bull kelp and you need to fish within a foot or less of the kelp to get hit. 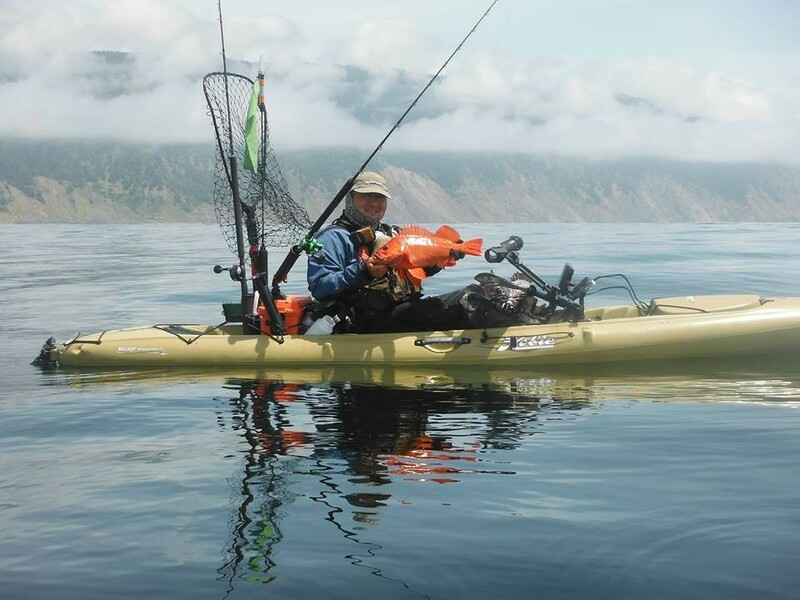 Having a hands free instant reverse pedal drive makes this type of fishing possible because it allows me to control the kayak against current and wind. Most important is being able to back away from kelp when hooked up with a scrapper before the fish can wrap my gear. The season will be here before we know it, so start looking through that tackle you no longer use and give it a try. You may be surprised. I can’t wait to get back out there in search of some rockfish and try out some new approaches this season.